The kitchen process has been moving ahead these past few weeks. We finalized the design & ordered everything at the end of December & then we waited while our cabinetry was being built! 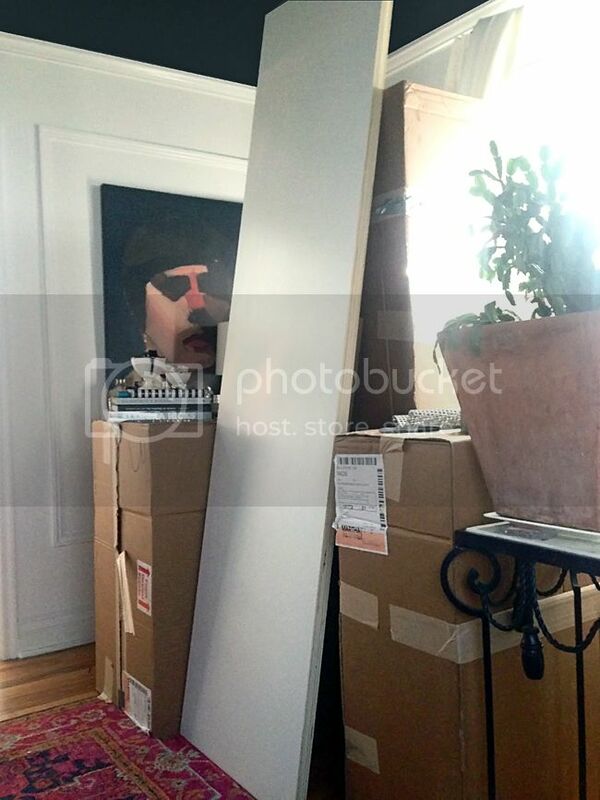 About 6 weeks later, we received a little delivery… and this was just half of it!! The install team from The Home Depot came over shortly after our cabinets were all delivered to double check that we had everything they needed to get started. We ended up having two lower cabinets that were backordered a week, but the team decided that we could go ahead with the demo & install what we already had to move forward. Demo day couldn’t come fast enough. My husband got so excited he went ahead & pulled all the doors down before the contractors even arrived. 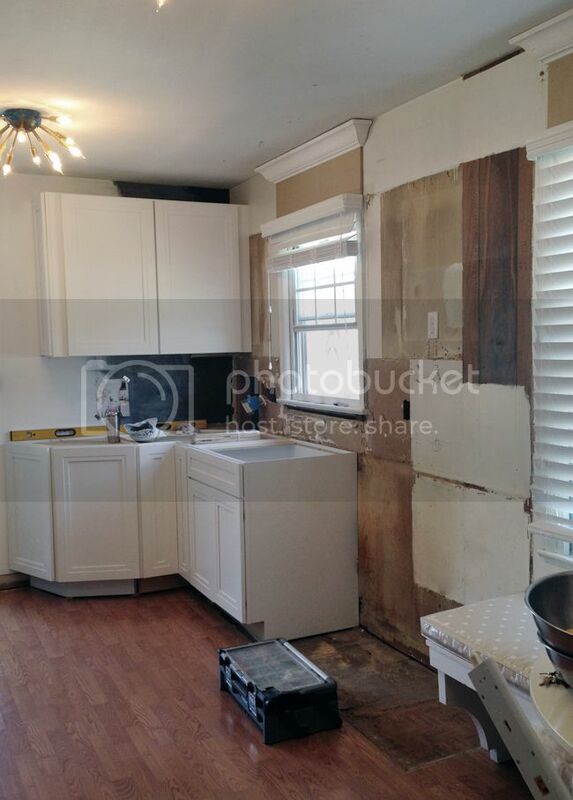 Not knowing what to expect when these cabinets came down, we kept our fingers crossed there would be no major surprises! 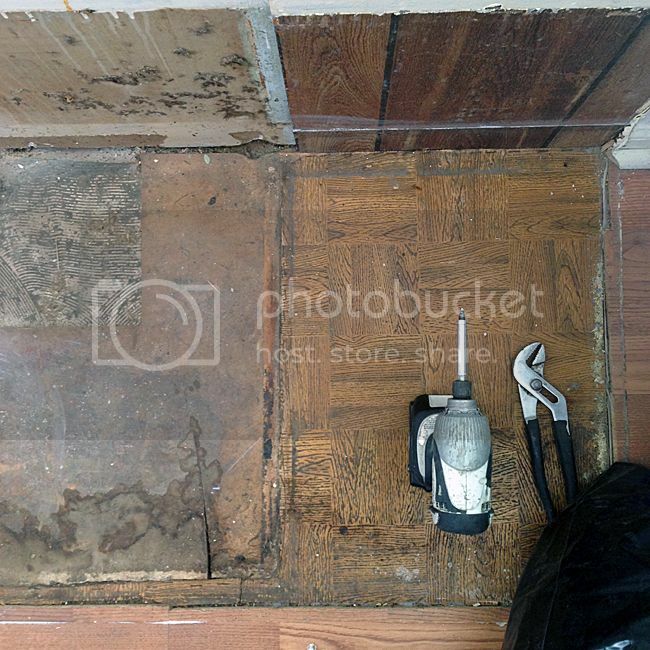 In what seemed like no time at all, our little kitchen looked like this! And it looked like our wall was hemorrhaging… Apparently someone got a little to excited with the spray foam back in the day?!! After the backsplash came down and some drywall was repaired, the new cabinets went up with lighting speed! 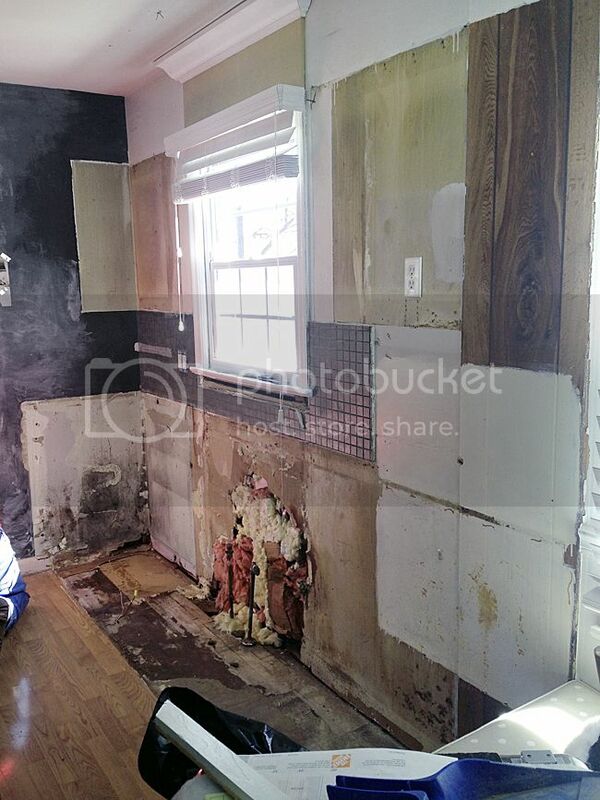 I am so glad I went with the Wellston Cabinet profile from Martha Stewart Living™. I am so in love with the double step detail & I can already tell you that the PureStyle™ finish is so easy to clean. 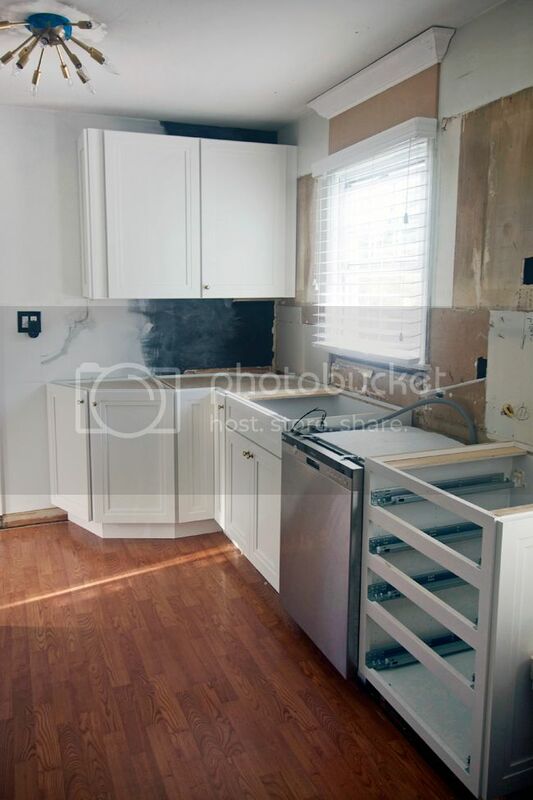 At this point we were missing the dishwasher & the last base cabinet… But we could already tell what an improvement this layout was going to be for us! A week later, the remaining cabinets arrived & they were set in place. 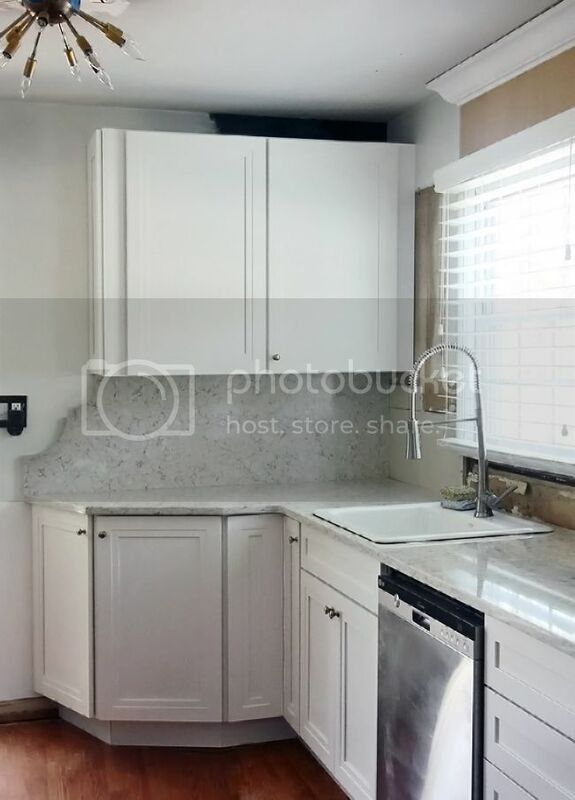 At this point I started thinking more seriously about my backsplash… You see when adding the new L Shape configuration, the angled base cabinet didn’t quite line up with the top cabinet leaving a potentially awkward backsplash situation. 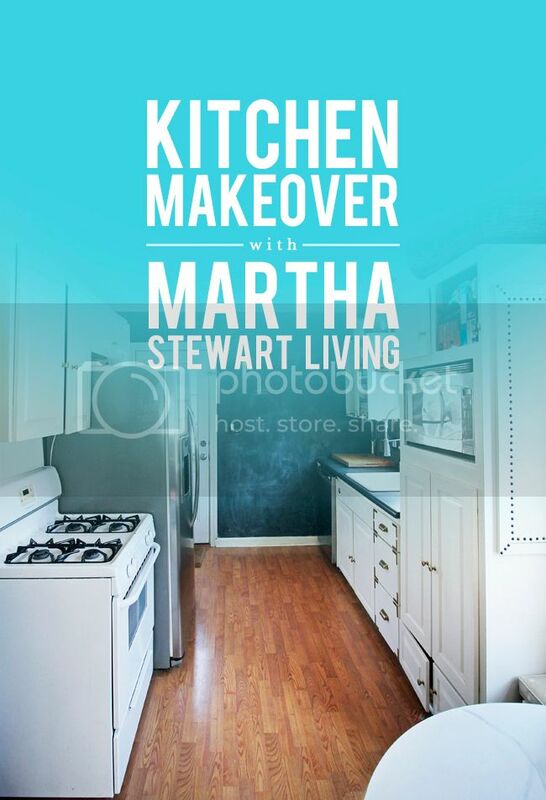 My solution was to continue the Martha Stewart Living™ LG Hausys Quartz counters up onto that wall as a full height backsplash & design a decorative detail that would marry the two together with a little more intention. I simply pulled out my pencil & started sketching directly on the wall until I got the look I was going for. The end shape actually emulates the banquette leg detail we created in our breakfast nook! I may have done a little happy dance at this point… not to mention the fact I literally almost teared up when I could place six plates onto our new countertops all at once. You see I could barely fit three given the space of our old counters, which made prepping dinner for four a little difficult to say the least. 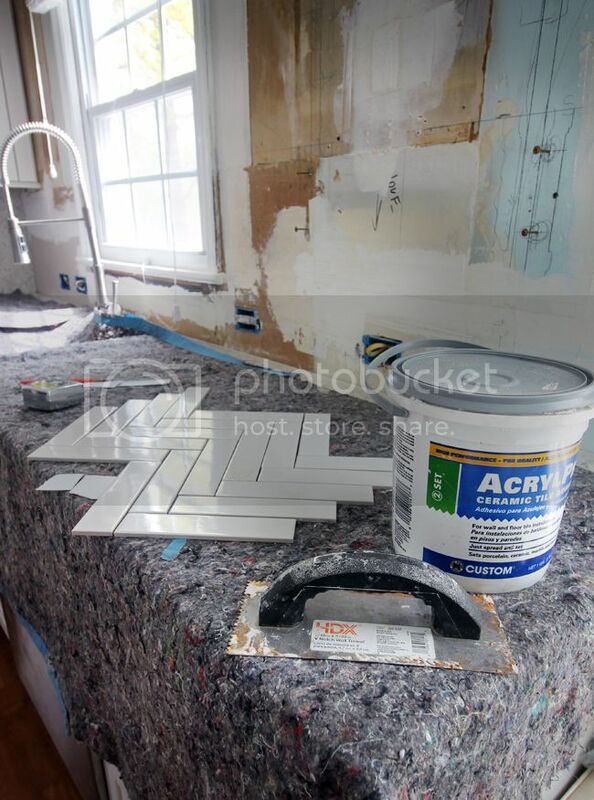 Once the counters were in, our contractor headed back out to begin tiling. He used nearly 350 individual tiles & made 191 cuts to create our new backsplash. But it was so worth it in the end!!!!! We are nearing the end of the renovation process with the contractors having one more day here to add the crown moulding & finish a few more small details like adding caulk & installing the rest of the knobs/pulls. 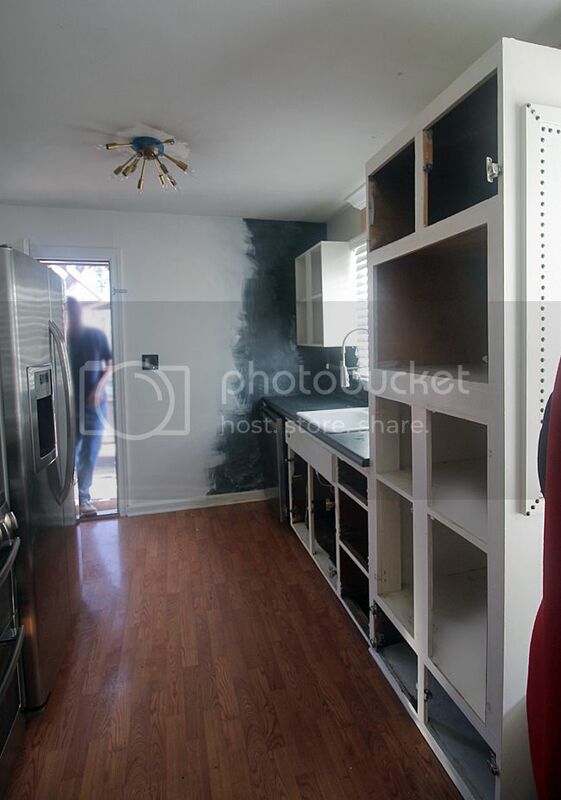 I also have a few more DIY projects up my sleeves too… So if everything goes according to plan, we’ll be revealing the final kitchen in just two weeks!! I have been beyond pleased with the quality of work & the professionalism of all of the contractors, plumbers, electricians that have been working on our project so far. Having the entire project managed through The Home Depot & their wide network of approved contractors allowed us to rest easy that the project would be installed properly. They have been happy to share tips & tricks with me too… you know I am storing those away for future plans! 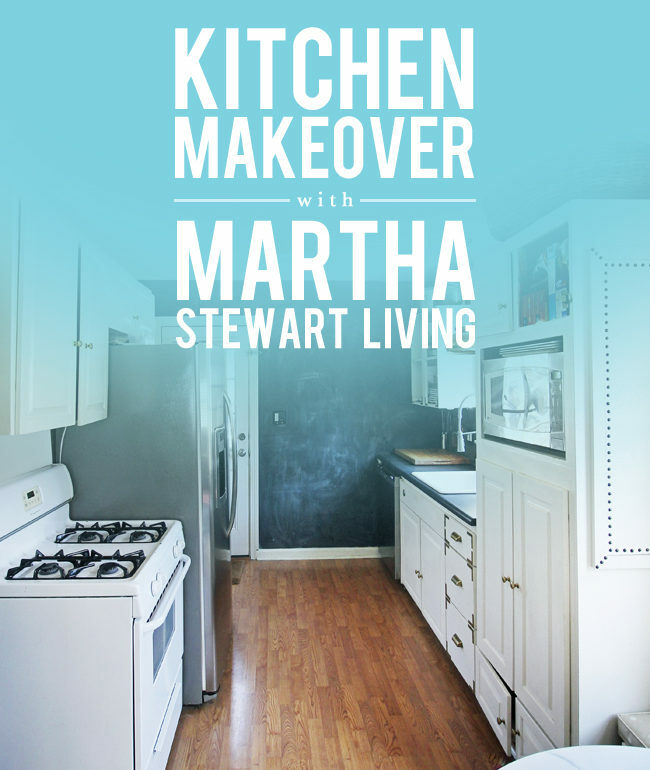 I have partnered with Martha Stewart Living Omnimedia, Inc. for this kitchen program. All expressed opinions and experiences are my own. Thank you to MasterBrand Cabinets, LG Hausys and The Home Depot for contributing to this project. I notice in your pics you have two different faucets, curious about the change! The new faucet was on backorder, and was the very last item installed once the kitchen was complete.